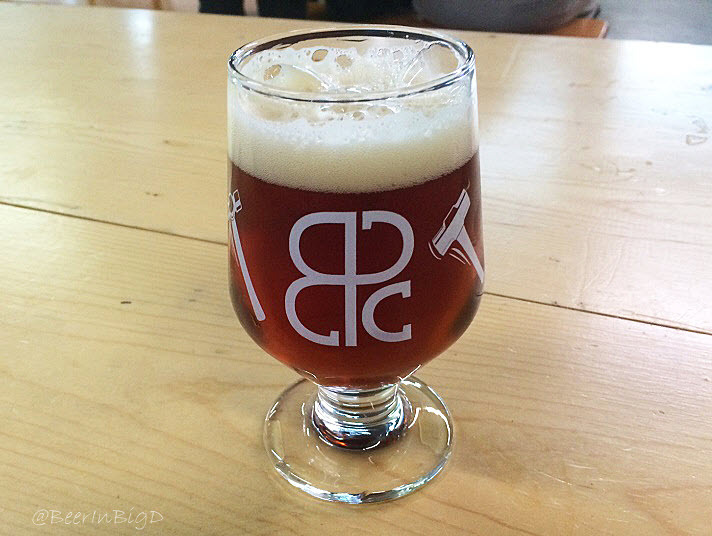 A pour of Peticolas Pick Hammer (© Brian Brown/Beer In Big D). Introduced at a small-scale event called "Making a Hammerer: A Peticolas Original Series," Pick Hammer debuted last night as the newest beer in the portfolio of the family-owned Peticolas Brewing Company. Billed as a lighter gravity version of Velvet Hammer, the new offering follows Sledge Hammer in being derived from the Dallas brewery's flagship beer. 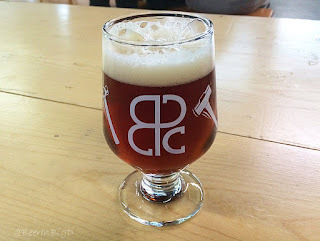 Along those lines, according to owner Michael Peticolas, Pick Hammer is made by utilizing the final wort runnings of two separate batches of Velvet Hammer. For those that aren't familiar, "runnings" refers to the wort collected after residual sugars are rinsed (or sparged) from the grain bed. Less sugar is extracted later in the process, and since yeast converts sugar into alcohol (and carbon dioxide) during fermentation, wort obtained from final runnings will result in a lower alcohol beer. Now, in traditional terms, a beer made with final runnings might be referred to as a "small beer," but in this case I would say that Pick Hammer isn't anything of the sort. While it's lighter and not as strong when compared to Velvet Hammer (9% ABV), the new beer isn't "light" and it certainly isn't weak. Pick Hammer has plenty of body, and it's no slouch in the strength department given an ABV of just under 7% . So, how does it compare to Velvet Hammer in terms of taste? Well, as you might expect, the two beers are similar, but different. Like its predecessor, Pick Hammer is a dark, reddish-brown beer with elements of caramel and brown sugar. Where it differs, though, is in how the beer attains its balance. Velvet Hammer is more malt-forward, balanced by a combination of its floral hop character and the beer's alcohol bite. Pick Hammer, though, doesn't really have that boozy factor to fall back on, so it seems to rely on a slightly stronger hop presence to help keep things in line. Other than that, though, my impression is that the two products taste a lot like the same beer. In fact, should you choose to read the commercial description for Velvet Hammer, which I actually wrote some years ago, you'll see I've purposely used a lot of the same terms up above for consistency. "...Velvet Hammer appears as a dark, ruby reddish-brown ale beneath a sheath of protective off-white foam. It is malt-forward with elements of caramel and the sweetness of light brown sugar, balanced nicely by a combination of floral hops and a noticeable alcohol bite. It’s a sturdy brew with a smooth character which belies both an inner strength and a slightly full body, along with a moderate bitterness to round out the taste." As far as whether or not Pick Hammer is sessionable, Michael's wife Melissa summed it up best when she suggested "It's a session beer for us," clearly referring to some of the more potent beers the brewery is known for. That sentiment was shared by at least one patron, who when pitting Pick Hammer up against the original said, "You could probably drink a few of these before getting," you guessed it, "completely hammered." Pick Hammer is draft-only and available for a limited time. In addition to the events listed below, look for it to show up at places where beer-to-go is an option, like Whole Foods, Lakewood Growler and Lone Star Taps & Caps. Craft & Growler, Dallas - 6 p.m.
Dallas Beer Kitchen, Dallas - 6 p.m.
Fillmore Pub, Plano - 6 p.m.